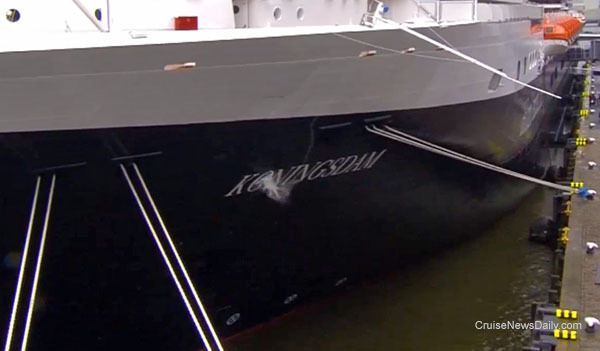 Her Majesty Queen Maxima of the Netherlands named Holland America's Koningsdam in Rotterdam this morning. 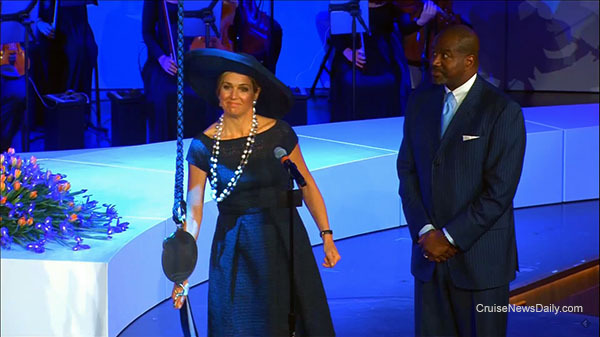 Prior to the actual naming, she also participated in the line's tradition of the blessing of the ship's bell. At the earlier ceremony, Holland America president Orlando Ashford announced that the line's next ship, a sister to Koningsdam due to be delivered in 2018, will be named Nieuw Statendam. 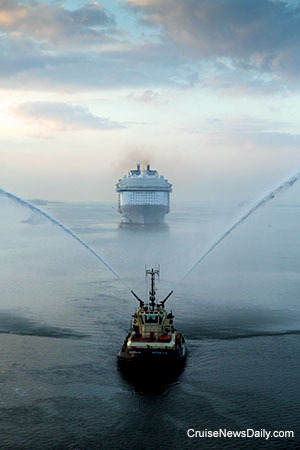 The complete story appeared in the May 20 edition of Cruise News Daily. 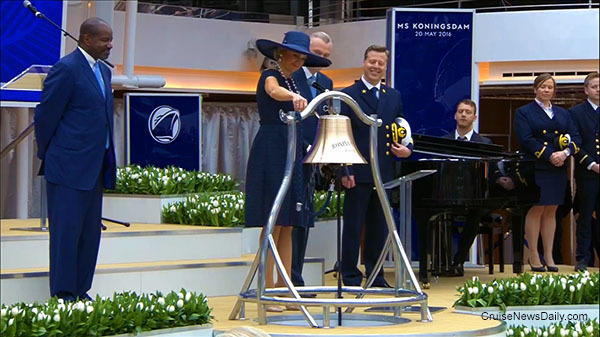 Her Majesty Queen Maxima blesses Koningsdam's bell. Photos copyright Holland America Line and Cruise News Daily. All rights reserved. May not be copied or used without express permission. Royal Caribbean will upgrade Southampton's City Cruise Terminal so passengers who have completed their embarkation forms online can be aboard within ten minutes of stepping onto the curb in front of the terminal. Carnival is ending their five-year relationship with comedian George Lopez. The mayor of Seattle proclaimed this "Seattle's Hometown Cruise Line Day." Details appeared in the May 20 edition of Cruise News Daily. Crystal bills their theme cruises as “Experiences of Discovery.” On two consecutive cruises this fall out of New Orleans the fall, you’ll either have the opportunity to discover twice as much or twice as many “experiences” because Crystal will be doubling up on themes and having two (count ‘em) two themes on each sailing. The complete story appeared in the May 19 edition of Cruise News Daily. Details appeared in the May 19 edition of Cruise News Daily. SAN PEDRO, Calif. – May 10, 2016 – Giving the local community an opportunity to see a working port up-close and in action, the Port of Los Angeles will be hosting its second annual Waves ‘N’ Wheels event on the LA Waterfront from 10 a.m. – 3 p.m. on May 21. With activities scheduled in both San Pedro and Wilmington, the event will feature free public boat tours and unique displays of Port vehicles and equipment – from massive cargo ships to tugs, to giant cranes and alternative-fuel vehicles, and more. The free Waves ‘N’ Wheels hour-long boat tours will depart every 30 minutes, both from Downtown Harbor at 504 S. Harbor Boulevard in San Pedro, and from Banning’s Landing Community Center, located at 100 E. Water Street in Wilmington. Reservations are not required for the tours, which operate on a first-come, first-serve basis. Both locations offer boats that are wheelchair accessible with restrooms available on board. This year a pre-event Pet Parade is also planned from 9-10 a.m, starting near the fire station at Harbor Boulevard and 5th Street in San Pedro, and looping to Fanfare Fountain and back. As a salute to maritime and World Trade Week, well-behaved pets and their pet parents are encouraged to dress in a “sailor” theme. There will also be a paw painting craft area set up. The Port is also encouraging visitors to take advantage of the many other LA Waterfront attractions as part of the celebration, such as the Cruise Ship Promenade featuring the Gateway Plaza Fanfare Fountain, Battleship IOWA, Los Angeles Maritime Museum and S.S. Lane Victory. Visitors can also plan a visit to one the many restaurants in historic downtown or Ports O’ Call, shop at CRAFTED at the Port of Los Angeles or grab a beer at Brouwerji West, the new brewery and tasting room opened this past February. For nearly 90 years, World Trade Week, (WTW) – an initiative of the Los Angeles Area Chamber of Commerce—has been the most extensive and unique program of its kind in the country. A week-long celebration, WTW focuses on educating the public about the importance and benefits of global trade on the local and national economy through a series of educational programs and events. The Port of Los Angeles is America’s premier port and has a strong commitment to developing innovative strategic and sustainable operations that benefit Southern California’s economy and quality of life. As North America’s leading seaport in terms by container volume and cargo value, the Port of Los Angeles facilitated $270 billion in trade during 2015. Port operations and commerce facilitate more than 133,000 jobs (about one in 14) in the City of Los Angeles and 479,000 jobs (or one in 18) in the five-county Southern California region. The San Pedro Bay Ports support nearly 1 million California jobs and 2.8 million nationwide. This is something you don’t see every day. In the “olden days” when ships were smaller, they used to build them on land (not in a dry dock), and then when it was time to put them in the water, they slid down rails into the water. Some yards still do that with small ships, and Fincantieri does it with “small” pieces of large ships. Today was one of those days. Fincantieri built the forward section of the bow for Carnival Vista 2 on land in their Castellammare di Stabia yard south of Naples. Today was launch day. The complete story appeared in the May 18 edition of Cruise News Daily. Australian’s are familiar with Melbourne-born chef Curtis Stone, but they haven’t had a chance to actually sample his talents locally. His restaurant is in Southern California, and another that he is about to open is there too. But his newest just opened - or arrived - but it won’t be there all the time because it’s aboard Sun Princess. Details appeared in the May 18 edition of Cruise News Daily. In case you haven't noticed, within the space of a couple of weeks, there are a lot of ships entering service, and each line is competing for the attention of cruisers and the media. It's hard to get attention for their new half-billion-dollar (or billion-dollar piece in some cases) piece of equipment. Carnival's German brand, AIDA, should get some attention with this video shot aboard their brand-new AIDAprima. The video features 20-year-old Austrian stunt bike rider Fabio Wibmer seeing AIDAprima in a most unusual way. Last week the crew aboard Costa Favolosa set a record. They created the world's largest spritz and served up the 1000-liter drink to passengers in a glass that was 1.5 meters high and 1.35 meters across. The record was certified as a Guinness World Record. You can see how they did it in 30 seconds in the video below. Photo courtesy of Royal Caribbean International. All rights reserved. May not be copied or used without express permission. The woman who went overboard from Carnival Liberty last Friday was actually the second person of the week to go overboard from a US-based cruise ship. The first was a 36-year-old man traveling by himself, who apparently wanted to be sure he wouldn’t be discovered missing until he had been in the water too long to survive. It was eventually discovered on video that the man went overboard from his stateroom balcony at 12:45am on May 11. The complete story appeared in the May 16 edition of Cruise News Daily. The US Coast Guard suspended their active search Sunday night at 8:14pm for a 33-year-old woman who went overboard from Carnival Liberty early Friday morning. Details appeared in the May 16 edition of Cruise News Daily. Royal Caribbean's Harmony of the Seas left the yard at Saint Nazaire (France) this weekend for it's first port call at Southampton. The video below shows the crowd of 60,000 local people who came out to see her off.